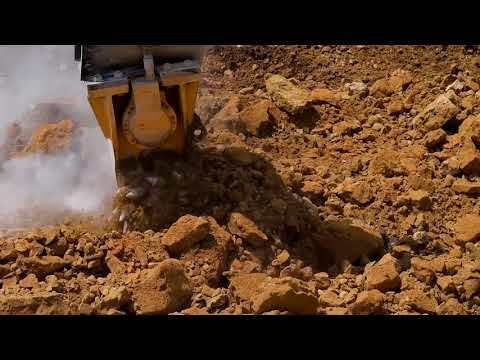 Watch the GCG 40 easily trench through rock. The GCG is covered by a 12-month, 1,500-hour (whichever occurs first) warranty. The GCG Cyclone rock and concrete grinder from Genesis Attachments brings new technology to the demolition, excavation and trenching, tunneling/mining and concrete grinding industries. Operating with minimal noise and vibration, the GCG is more effective than hydraulic breakers in some applications. Featuring design advancements over traditional grinders, the GCG's two-hose hydraulic system eliminates the need for a case drain line and simplifies installation. The soft start system and protective valving protect the motor from over-pressure, over-heating and misuse. Requiring minimal maintenance, the Genesis Cyclone rock and concrete grinder features heavy-duty bearings and seals to withstand harsh applications. The GCG's optimized pick patterns provide smooth and powerful operation while lower vibrations reduce machine and operator fatigue. Additionally, the Cyclone can be used in noise-sensitive areas such as residential neighborhoods. Available with a chain, gear or direct-drive motor determined by model size to maximize performance on the respective excavator weight class, the GCG fits 1,400 to 250,000 pound excavators. For additional product, application or service information, call us at 1-888-SHEAR-IT.